Finally good news for Indian Hindi bloggers from Google. Recently Google introduced Hindi language support in their Adsense advertising program. Earlier Google Adsense ads were not supported on Hindi language blogs and websites. But with this new Hindi language support more than 500 million Hindi speaking people will be able to monetize their websites. 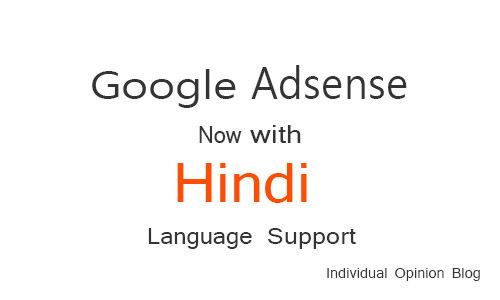 In 2008, Google stopped supporting Hindi language in Adsense which was very surprising for many Hindi language bloggers. It forced them to move to other Google Adsense alternatives. The reason probably was that Google was not making good amount of money from Hindi blogs and websites. As the growing market of smartphone which makes the internet reach of large population of hindi speaking people easy and cheap, Google finds a big internet market of largest speaking language in India. So, It’s once again available for Hindi bloggers and in better way. 1- Sign up for Google Adsense account and enroll your hindi website. Select your websites primery language as Hindi. 2- Make sure your website fullfill the Adsense program policies. 3- Google could take more time to approve your AdSense account. Once your Adsense account has been approved, Add adsense ads to your website. Don’t worry if your website has content in multiple language. Google Adsense is smart. It’ll autometically detect the language and display the relevant ads.